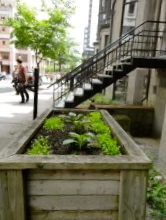 Come out and put your green thumbs to work with the City Farm School team that has been building this edible urban oasis in downtown Montreal. Wear clothes to get dirty in cause we’ll be seeding, weeding, fertilizing, watering and watching our garden grow! Don’t worry if you don’t have much experience. The City Farm School interns will be there to help you along. Meet us in front of Sustainable Concordia 2090 Mackay – beside our new raised bed!